Following this event the Thai government has organized a month-long exhibition in honor of this great yet humble man, whose wisdom, guidance and love for his people was evident in everything he did. 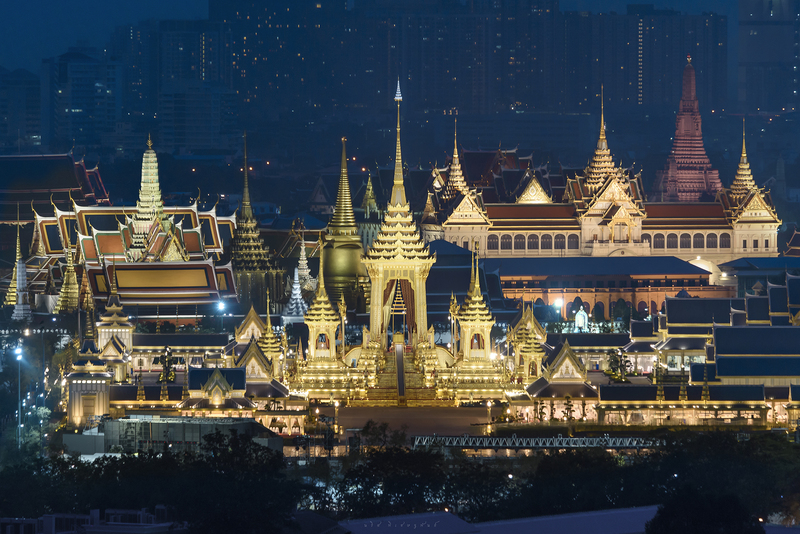 The exhibition will be held at the Royal Crematorium and Sanam Luang Ceremonial Ground in Bangkok from the 2nd November – 31st December between 7 a.m. and 10 p.m. and will be a unique opportunity to witness the lifetime’s work of one of the world’s greatest members of royalty. The Phra Tingang Song Tham, or Royal Merit-Making Pavilion, will feature a biography of His Majesty and the many Royal Projects he initiated throughout the four corners of the kingdom, to bring aid and assistance to the people he loved with all his heart. At the Sala Luk Khun, or Government Officials Pavilion, the displays will include a construction of the Royal Pavilion and renovations of the royal chariots and palanquins, a covered litter used by royalty and borne aloft by bearers, as well as architectural works and stunning artistic creations. During the exhibition there will be a series of cultural shows and public performances each evening paying homage to His Majesty and is the perfect way to witness a true glimpse of traditional Thai culture and the adoration in which the Thai people hold this remarkable king. To visit the Exhibition by boat from Chatrium Hotel Riverside Bangkok, first go to Sathon Pier by our shuttle boat and take the river taxi to Chang Pier. Sanam Luang is approximately an 8-minute walk away. From Chatrium Residence Sathon Bangkok the journey by road will take 38 mins (11 kms), from Maitria Hotel Sukhumvit 18 – A Chatrium Collection 45 mins (9 kms) and from Emporium Suites by Chatrium 47 mins (13 kms) by taxi or other form of transportation if you wish to travel by road. Next PostNext It’s Dad’s Delicious Dim Sum Day of the Year at Silver Waves!